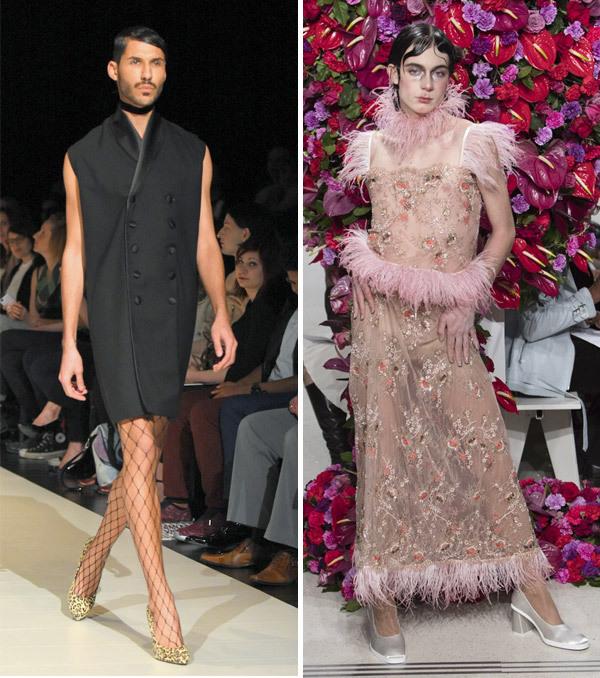 Last week, I wrote that in my world, most women wear slacks, trousers, jeans, etc., rather than dresses and skirts, that is, garments that I am more likely to see on a transwoman than a cisgender woman (not that there is anything wrong with that). And I concluded that "I dress like a woman when I am in boy mode and I dress like a transwoman when I am in girl mode." That notion was dismissed by many writers as being outmoded in this day and age when woman are on the front lines working along side their equals: men. Women are too busy getting the job done to be concerned with what a man deems to be proper attire for a working woman. In light of this dispute, it is interesting to note that the redefinition of masculinity marches on. 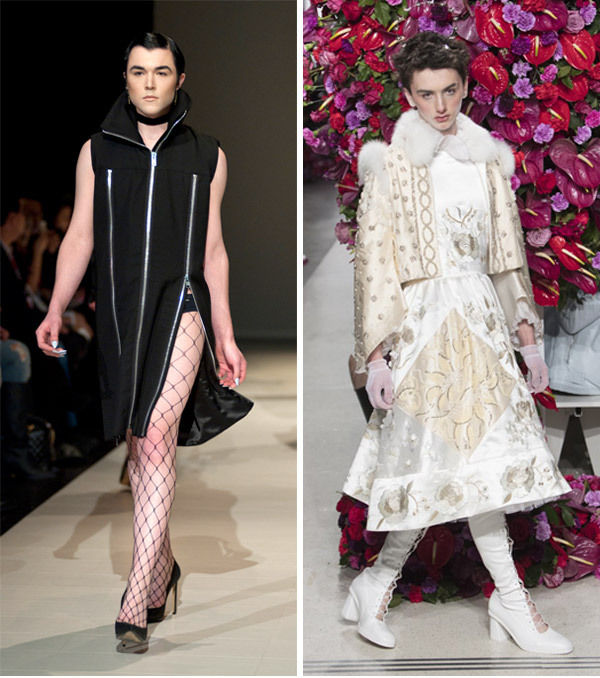 Take a gander at how fashion designers are dressing men these days. 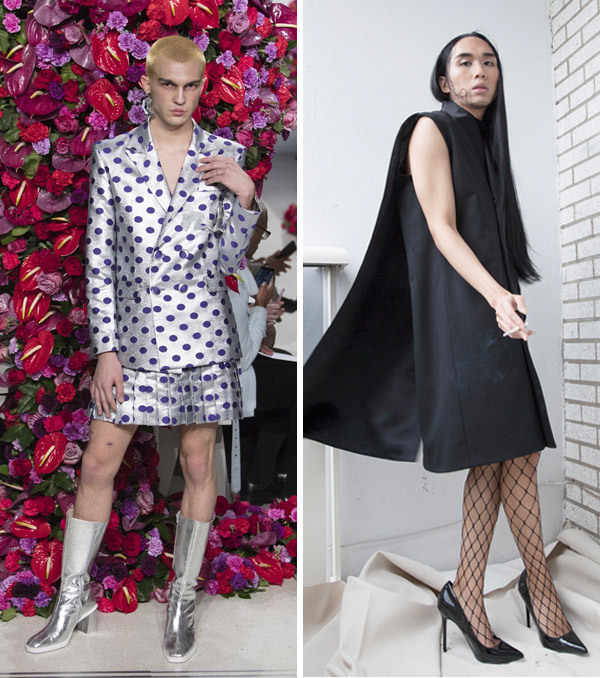 At first glance, I thought I was viewing images from womenswear collections, when, in fact, I was looking at the latest in menswear (from Luomo Strano and Paloma Spain)! Someday, a female president may prefer that the men who worked for her dressed like these men. Matthew Banasiuk femulates Kylie Minogue on Polish television's Twoja Twarz Brzmi Znajomo. If I only had the gumption to follow his directive all the time, I'd dress like a woman 24/7. I already "underdress" almost all the time and most of my home time is en-femme. I do wish to go 24/7, someday it'll happen. Folks of a certain age (you, me and Trump are in that group) remember proper business attire and decorum. There are still days when I need to be in a suit and women professionals in a power suit or a nice dress stand out from lower level workers. After 8 years of semi casual attire in the Oval office with shirt sleeves, lack of jacket and tie and photos of feet up on desks and furniture it may be that Trump is looking to restore some decorum to the WH. I love Matthew Banasiuk's femulation!!! First of all, he is an absolutely gorgeous and 100% passable SHE. His blouse and skirt are so sweet. I love the fabrics of the skirt, its length, and its "swishiness" ... it looks so wonderful swaying back and forth. Putting his name and the TV show's name in the YouTube search box turns up a couple more different of his femulations on other episodes of that show. He has such an authentically gorgeous female face when made-up that I imagine the workers on the show who decide whether a guest dresses as a man or woman can't help themselves from having Matthew femulate often. He looks like he enjoys it too! We can all relate to that. "I enjoy being a girl". These photos are all very well and just like those of 'real' girls when young. Eventualy both sexes grow old and most females morph into the same body shape as many males. When they abandon all the superficial elements that make them more feminine most females look more like males. The older they are the more like men then tend to look - short hair, no make-up, trousers, fat bellies and shoes! It's encouraging that these young males can look like young females but given time most will lose the ability - just like real girls do. So enjoy the time while you can - it will soon be a distant memory.